Pumpkin juice! Yes, it may sound weird but it is a great substitute for carbonated drinks. Made from raw pumpkins, the juice contains a variety of vitamins like A, B1,B2,B6,C,D, E and vital flavonoids, and poly-phenolic antioxidants like leutin, xanthin and carotenes. It also contains minerals like potassium, phosphorus, calcium, magnesium and iron. With so many nutrients present, pumpkin juice makes a superb healthy drink with a variety of health benefits. Some of them are listed below. Good for the liver and the kidneys- Pumpkin is very good for the liver and the kidneys. People suffering from kidney stones and gall bladder problems can improve their condition by drinking ½ a glass of pumpkin juice three times a day for 10 days. 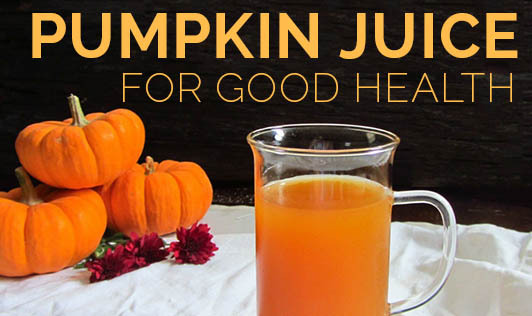 Protects the heart- Pumpkin juice removes arterial deposits and thus reduces the risk of heart disease and stroke. Regulates digestion and bowel function - Rich in fiber, pumpkin juice has laxative properties and cures both constipation and loose motions. Good sedative- Several studies show the effectiveness of pumpkin juice in curing insomnia. A glass of pumpkin juice with honey is advised to calm the nerves and induce sleep. Regulates blood pressure & cholesterol- Pumpkin juice contains a variety of phytosterols and pectin that help to reduce LDL cholesterol and high blood pressure levels. Excellent summer drink- Pumpkin juice along with honey acts as a coolant against external heat and makes an excellent summer drink. Relieves morning sickness- Pumpkin juice is effective in relieving morning sickness in pregnant women. Re-activates liver function in hepatitis A patients- Biologically active substances in pumpkin juice reactivates liver function and heals hepatitis A patients. Improves immunity- Pumpkin juice is a very good source of vitamin C and protects the body. Just half a cup of juice is enough to gain medical and therapeutic benefits of pumpkin. So where is your glass of this marvelous juice?